Does the star of your painting add glamour or barely a glimmer to your work? Does the star of your painting reach out and grab the viewer or does it act like a shy teenager and fade into the background? Are there so many things in your painting shouting for the viewer's attention, he quickly gets overwhelmed and moves on? If you never intend to show your work outside of your immediate family, these questions may not matter to you. If, however, you have dreams of sharing your work with the world, or, at least, a local portion of it, knowing how to create the stunning star of your painting becomes much more important. Today I'm going to show you two more ways to define your star through shape contrast and detail contrast. Shape contrast is accomplished when your star stands out by being different than the shapes surrounding it. Look at the illustration at left. The square is noticeable because of the difference in shape, as well as a difference in value. If I take away the value difference and leave only the shape difference, you can see in the second illustration that, while the square is more subtle, your eyes still go to it. The same thing is happening in my painting below. 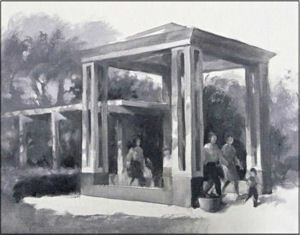 The shapes of the people contrast with the vertical posts in the covered walkways. As in all the examples I've shown you, values also play role here. I have intentionally placed my lightest and darkest paint values around my stars to help draw the viewer's eyes. That gives me two kinds of contrast working to attract attention to my stars. And I've got one more kind of contrast working for me. The fifth way to create the star of your painting is by putting more detail in your star than in the rest of the painting. In my painting the posts of the taller walkway stand out against the softer, less detailed background, helping to draw your attention to that area of the painting. But, be aware that the opposite can also work. Look again at the grey square above. Another reason the grey square stands out is because it is a very simple shape in the midst of a lot of chaotic curves (detail). Contrast of any kind draws the viewer's eyes. And having more than one kind of contrast working for you to create the star of your picture can be good insurance. If you have friends on Facebook, Twitter or other social media, that would enjoy this article, please pass it along to them using the buttons at the bottom of this page.